I haven’t been near this blog since last month because life has been incredibly busy (in a good way). The last time I checked in with great news about JET BLACK HEART, I was at the start of a jam-packed schedule of teaching, school visits, events and workshops. The studio started to resemble a dumping ground. I worked around piles of paper and books, sketches and snippets of material going into my current manuscript. Today I did a ritual tidy-up of the studio. It was like an archeological dig. I found things related to my exciting new post teaching Illustration at Leeds College of Art. I unearthed bits from my recent Ilkley Literature Festival talks and creative workshops at Otley Courthouse, Farnley Academy, David Young Academy and Keighley Library. I looked at my photos of the wonderful building that houses Belmont Grosvenor School, where I spent a day making books with pupils last week. 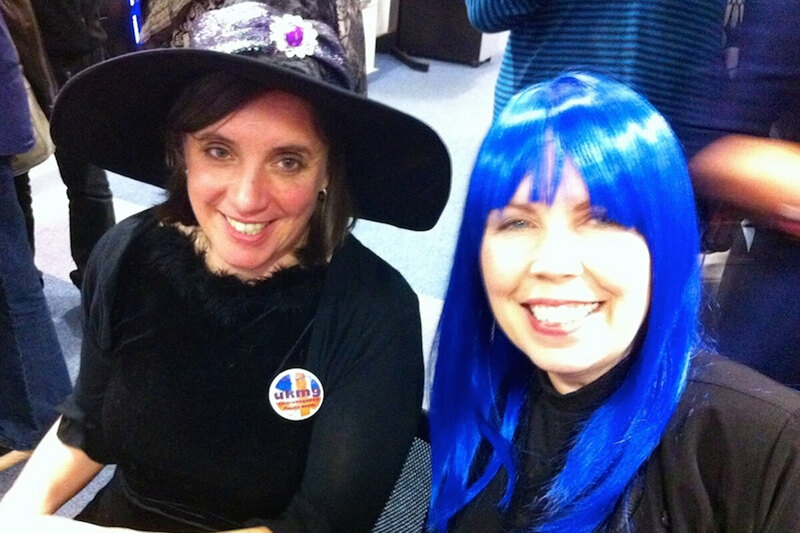 And I brushed the blue wig that I wore to the UK Middle Grade Extravaganza, a celebration of books and authors at Nottingham Central Library. It wasn’t required but since we are so close to Halloween, it seemed reasonable to come as one of my characters. Aurora Midnight, the silhouette-cutting artist from THE SHADOW LANTERN, was an obvious choice since she has blue (and violet) hair. So my wig wasn’t entirely accurate but it was a lot of fun to wear, especially since some of my fellow authors didn’t recognise me immediately. Now that the studio is sorted out, what next? Back to creating. I have a manuscript that keeps tapping me on the shoulder and some images I want/need to draw. Working with so many enthusiastic and talented young people over the past weeks has been inspiring – as much for me as I hope it has been for them.